Enriched with clay and lemon essential oil, Cattier Dentargile Lemon Toothpaste soothes and protects irritated gums and promotes healthy teeth and strengthened gums. 75ml tube. 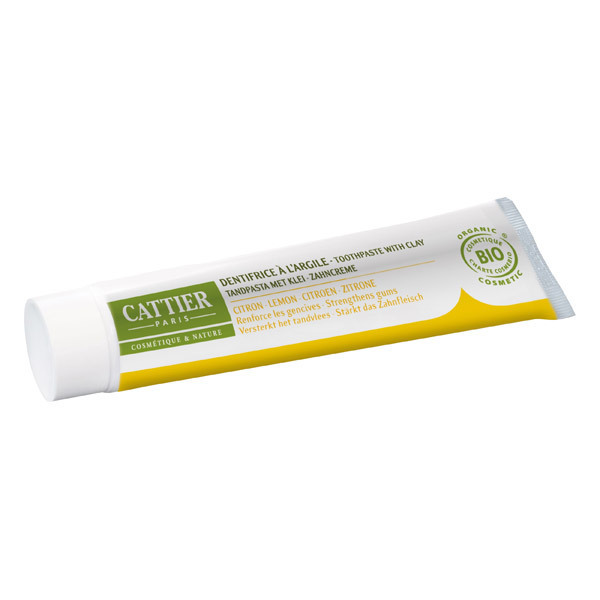 Cattier Dentargile Lemon Toothpaste is ideal for irritated gums. Ingredients: Aqua, Sorbitol, Anthemis nobilis, kaolin, glycerin, sodium lauryl sulfate, carragenenn, benzyl alcohol, titanium dioxide, sodium chloride, Citrus limonum, Usnea barbata, citric acid. After every meal, gently brush from the gums to the teeth for 3 minutes. For total protection, before rinsing your mouth, squeeze a small amount of toothpaste on the tip of your finger and gently massage your gums. IMPORTANT: Compatible with homeopathic treatment.